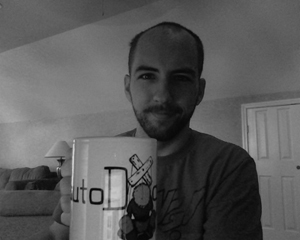 Justin Owings – Page 27 – Writer, doer, dad—working out complexity from Atlanta. I think and lift heavy things. Here’s a brief life update. The wife and I are in Augusta. We’ve been here on an ongoing basis since late December; prior to our move beginning in June of 2007, we found the need to spend about two-thirds of our time in Augusta (The rest being spent in Atlanta at our place in Ansley Park). I won’t go into it, but there were (and are still somewhat) some family things going on in “the AUG” that required our presence. Despite having spent most of the past year in Augusta, I still consider myself an Atlantan. As much as Augusta has going on for it, the move here is temporary. We are likely to be here for a few more months and will then either move on back to Atlanta or move somewhere else (Maybe some place entirely different — Abroad? Another U.S. city? Trying to figure that out). Our mobility has been largely driven by the nature of my current work, which continues to be development of the Implode-O-Meter network via our flagship MLI and the others (HFI, HBI, BI, and the forums). Web entrepreneurship is fantastic in this regard. It is hard to beat requiring only an internet connection and a laptop to work, and ofttimes, my Blackberry is sufficient. The fundamental drawbacks include the always-open nature of websites and the gnawing understanding that most all websites have a terminal shelf-life. That latter point is less true for personal sites like this one — at least, I hope to live a long and interesting life. Of course, this site isn’t likely to result in any tangible wealth! What’s there to do in Augusta? Aside from mountain biking the excellent trails at FATS or going to the occasional movie, not a lot. I’ve been spending my leisure time trying to get in shape via improved diet and working out with a VKR station and kettlebells. I’ve experienced good results from this combo (high intensity, low-carb and fasting). Just a few days ago, I happily discovered that Augusta has a newly formed Crossfit gym (Site “under construction” — and though the site doesn’t say it, they’re located at 766 Industrial Park Drive). Sonal and I went and checked it out last Friday, doing a modified version of Helen. Having completed another WOD yesterday (One by Rob Miller), I can say with confidence that Crossfit is not for the weak of heart. I expect doing Crossfit will do wonders for my fitness, moreso than I would have been able to accomplish with my poor-man’s home gym. We’ll see. With all things health, I’ve been taking some progress photos that I want to make public in the coming weeks. The first of these stretches back to February of this year. Stay tuned. Otherwise, I’ve been spending time enjoying the wonders of OpenArena, a free, improved version of the classic FPS Quake III Arena. I play with my trading buddy and college-chum “papahalv” (We “DOMINATE” via our satirical, two-member “clan” CBB). And speaking of trading, I’m on the road to recovery from getting blown out of the water by Fed Shenanigans last August and then again in late November. That’s a story for another day. The quiet life of Augusta has also allowed me to catch up on reading. For details, check out my books page. I’ve mostly been bouncing between Sci-fi and science books lately. On the family front, I became an uncle in mid-March. Oh the plans I have for that one. And that’s it. Just wanted to provide an update on my personal life for the “historical record” and to update anyone who’s interested. I’ll try to incorporate more “biogblogging” (or “bioblogging?” Just made that up) in the future! I wake up, but it is still early, so I roll over, readjust and keep my eyes shut. When I finally give in and rise, my cat decides to join me, and does his morning stretch — arched back, curled tail, yawn — you know the drill. I copy him as best I can. Coffee. While I wait for it to brew, I gulp down some cold water and feel it invade my throat and stomach. I gulp again but the effect is gone. I look out the kitchen window and note the sun’s light is not yet harsh. I imagine it is even bearable outside, maybe even pleasant. It won’t last. The newsman said today will be a scorcher, triple-digits — brutal. The warm mug in my hand, I find an inner calm in the new day’s stillness. Another week’s demands lay ahead, but they will wait. Today, I rest. The physiological stress resulting from caloric restriction may extend your life. It could accomplish this by switching resources from reproduction to self-preservation. Alternatively (or additionally), it might accomplish this by helping downregulate insulin, thereby reducing the diseases associated with metabolic syndrome. Resveratrol (Via red wine, for now) might also slow aging via some SIRT-1 mechanism or by somehow signaling to the body that stressful times lay ahead. The stress from exercise3 might slow aging by activating physiological mechanisms of tissue self-preservation, as well. And finally, I can chalk another one up for intermittent fasting, which personal experience says is the easiest way to practice caloric restriction. [T]he door has now been opened to drugs that exploit an ancient biological survival mechanism, that of switching the body’s resources from fertility to tissue maintenance. The improved tissue maintenance seems to extend life by cutting down on the degenerative diseases of aging. The reflex can be prompted by a faminelike diet, known as caloric restriction, which extends the life of laboratory rodents by up to 30 percent but is far too hard for most people to keep to and in any case has not been proven to work in humans [See Footnote 1 for discussion on this last sentence]. CALERIE suggests the [advantages of caloric restriction] are real. For example, those on restricted diets had lower insulin resistance … and lower levels of low-density lipoprotein [LDL] cholesterol. They showed drops in body temperature and blood-insulin levels?both phenomena that have been seen in long-lived, calorie-restricted animals. They also suffered less oxidative damage to their DNA. Resveratrol is produced when a vine is under stress?for example, due to dehydration or over-exposure to sunshine. According to Dr Sinclair’s theory, which he calls xenohormesis, animals rely on such botanical stress signals to give them extra information about their own environments, in the same way that the alarm calls of one species warn others of danger. If bad things are happening to plants, he surmises, that is a reason for pre-emptive animal action. Animal bodies thus react to molecules such as resveratrol by activating their own defence mechanisms. These, in turn, protect their cells from stress-related damage. Xenohormesis is a variation of a more general theory, hormesis … A good example of hormesis is exercise. In theory, this should damage cells because it increases oxygen uptake, and oxidative stress is bad for things like DNA. Of course, exercise is not actually bad for cells?and the reason is that the body activates defence mechanisms which overcompensate for the stress the exercise creates, producing beneficial effects. So, while chronic stress is always bad for you, a short period of mild stress followed by a period of recovery can be good. So what’s the common denominator between exercise, resveratrol, and caloric restriction? Stress. The introduction of acute stress may switch the body’s resources from reproduction to self-preservation4. From an evolutionary perspective, this makes sense. If a band of human beings were facing environmental hardship, such as a famine, their bodies would need to self-preserve until times more suitable for the ultimate biological imperative, reproduction. Beyond acute stress causing self-preservation and thereby slowing aging, there may be another angle here: insulin. Caloric restriction will reduce insulin loads on the body as entering a fasted state will require the body to switch from glucose-burning (Insulin upregulated) to fat-burning (Insulin downregulated). As I’ve blogged before, chronically high insulin (via diets high in carbohydrates) in the blood is positively correlated to metabolic syndrome or Syndrome X. The connection to slowed aging and lower insulin levels could just be the other side of the same coin, but if nothing else, it’s more support for incorporating some amount of caloric restriction in your life. 1 I’ve got a question out to the author, Nicholas Wade, as to his last claim regarding caloric restriction and its impact (or lack thereof) on humans. I’m fairly certain that Wade means that the life-extending impact of caloric restriction has yet to be proven for humans, even though the CALERIE study mentioned above would contradict such a claim. I take serious issue with Wade’s ambiguity here. Most of his article is about resveratrol and sirtuins and their potential link to slowing aging in humans. He goes into detail about a pharmaceutical company that is working on producing a drug that might induce the same effects. That’s fine, but why slam the door on an alternative (caloric restriction) that might slow aging for free? Is it because it’s “far too hard for most people”? How did he determine that? Or do you mean that sufficient testing on caloric restriction’s impact on human aging has not occurred, thereby the theory remains unproven? He indicated that the above interpretation was the one he intended. I will let him know about the CALERIE study. 2 Here is the official CALERIE website. 3 Perhaps therein lies some support for the claim that endurance training is unhealthy as it puts a chronic load of stress on the body. I practice intermittent caloric deprivation. This is a known enhancer of the immune system. This is pure evolutionary reasoning. During deprivation, the system reallocates resources from reproduction to repair and maintenance. The immune system is part of that adaptation. If you read any medical school biochemistry textbook, you’ll find a section devoted to what happens metabolically during starvation. If you read these sections with a knowing eye, you’ll realize that everything discussed as happening during starvation happens during carbohydrate restriction as well. There have been a few papers published recently showing the same thing: the metabolism of carb restriction = the metabolism of starvation. I would maintain, however, based on my study of the Paleolithic diet that starvation and carb restriction are simply the polar ends of a continuum, and that carb restriction was the norm for most of our existence as upright walking beings on this planet, making the metabolism of what biochemistry textbook authors call starvation the ‘normal’ metabolism. As noted before, this makes intuitive sense. While in a fasted state, the body gets its energy fix by robbing the protein for gluconeogenesis from lean tissue and the fat for energy from adipose tissue. While doing low-carb, the body does the same thing — the only difference is that it gets the fat and protein from dietary sources. The rest of the Eades article discusses ketones/ketosis, which I’m still working on fully understanding (the basics, anyway). Apparently there are other benefits to occasionally being in a ketogenic state that may include “de-junking” our cells. Neat! Cook with coconut oil — try it instead of olive oil for sauteing fish, beef, pork, etc. The medium-length saturated fats in coconut oil are good for “quick energy” because they require little digestion before being quickly absorbed into the body. I cooked with coconut oil at lunch today and was sort-of jazzed all afternoon. Further testing will be required. Addendum: Found this abstract of a study on medium-chain triglycerides: the study showed a 12% rise in basal metabolism on MCTs as compared to only a 4% rise for LCTs. Once again fats win out over carbohydrates. And with even more tasty fats to choose from, its only that much more compelling to jettison the crummy carbs from my diet. I picked up some coconut oil from Wal-Mart yesterday. Mind you, it was hardly the uber-natural, ultra-low-processed stuff I should be buying, but I only realized that today. I’ll work on getting the good stuff later; in the meantime, the Louana brand will do just fine. rancid easily. … coconut oil was one of the foods Weston Price studied in his journeys. He discovered that the coconut was considered, by the local populations, a medicine food. He found that those civilizations that consumed coconut regularly had no knowledge of cancer, heart disease, arthritis, and diabetes. Coconut oil is called the “low fat” fat. … It boosts one’s energy and endurance. Many athletes use it blended into their drinks. It also supports thyroid function and increases your metabolism (great if you want to lose weight). These are some pretty extravagant claims. And unfortunately, they were not footnoted or referenced. A book by Bruce Fife was mentioned (See the nearest match available on Amazon, to the right), which might go into detail on some or all of these claims. Setting aside some of the more panacea-esque claims, its hard to miss the correlation between consuming coconut oil and preventing metabolic syndrome (A.K.A. “diseases of civilization”), which may be linked to loss of insulin sensitivity or the damage of abundant insulin, which we know is linked to eating carbohydrates. Though I can only speculate as to cause-and-effect, its reasonable to assume that cultures whose diets have a higher percentage of fats in them relative to carboyhdrates are less likely to succumb to the problems associated with insulin (hypertension, diabetes, obesity, cardiovascular disease, etc. — metabolic syndrome). The bacteria-destroying aspect of coconut oil is intriguing, as well. I understand why saturated fats naturally have a longer shelf-life (Lack of easily broken, carbon=carbon double-bonds), but I can’t help but wonder if another reason coconut oil takes so long to go rancid is some anti-bacterial trait of the oil, itself. Coconut Oil — Wellness Directory of Minnesota — The rest of the quoted piece above. Health and Nutritional Benefits from Coconut Oil: An Important Functional Food for the 21st Century — A research paper by Mary G. Enig, Ph.D.
A website dedicated to coconut oil. Just found an informative read about fats and oils over at Mark’s Daily Apple written by guest poster Scott Kustes of Modern Forager. In the post, Kustes explains that the molecular bond stability of saturated fats makes oils high in saturated fats ideal for cooking. Amongst the four types of fats, saturated, monounsaturated, polyunsaturated and trans, (trans being the only unequivocally bad fat), the lack of double-bonds in a saturated fat molecule makes it less prone to degenerating / breaking down when left sitting around or cooked. On the other hand, monounsaturated fats have one double bond (See this graphic, bottom molecule for an example of a monounsaturated fat) and polyunsaturated fats have multiple double bonds. Double bonds are easier to break, so mono- and, even moreso, polyunsaturated fats are more unstable. The big takeaway? When reaching for oils for cooking, coconut and palm oils as well as animal fat are all ideal choices as they consist of mostly saturated fats and monounsaturated fats (more of the former than the latter, at that). Another interesting takeaway was that the the short chains of saturated fats found in coconut milk (or oil) are immediately absorbed into your blood via your stomach, resulting in a boost of energy which can noticeably raise body temperature, metabolism, etc. I might have to try that one out and see what happens. Makes me wonder if coconut milk might be an ideal beverage for endurance athletes who need an energy boost. One other thing I learned whilst scanning Mark’s Daily Apple: apparently, whisky, gin, vodka, scotch, and 100% agave tequila all have zero carbohydrates. 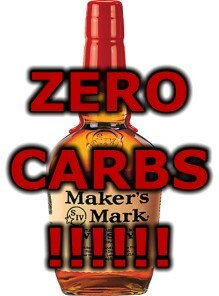 I was immediately a little skeptical as I find Maker’s Mark to be a bit sweet — but upon checking it out, yep, zero carbohydrates (I consider Maker’s Mark my reasonably affordable whiskey of choice).